Once your instance is in the ‘Active’ state, you can connect to the instance. All instances support connection at the command line via SSH. Many (but not all) instances may also have a graphical desktop. You can connect to these desktops via a VNC viewing client. We will cover both methods in this guide. 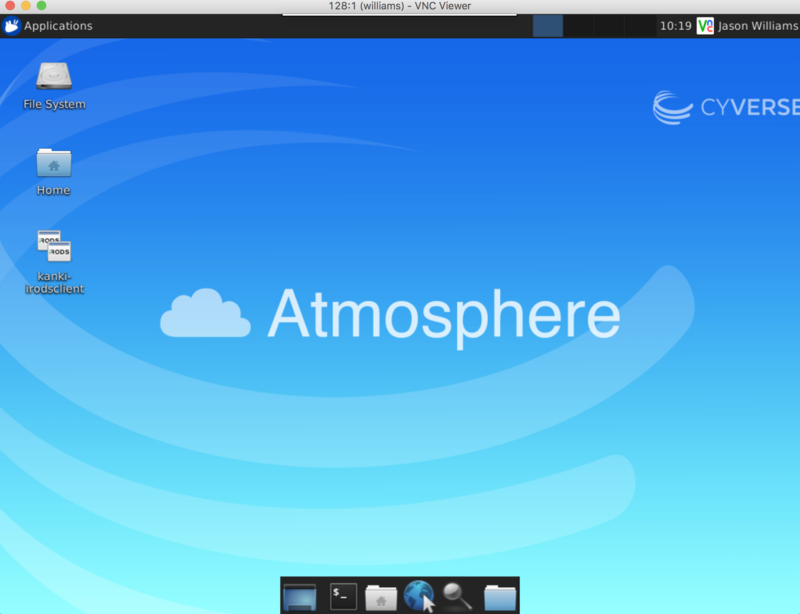 If necessary, login to Atmosphere and locate the instance you are connecting to in a given project. Locate the IP address and copy this to your clipboard. Open your computer’s terminal application. The authenticity of host '128.196.64.200 (128.196.64.200)' can\'t be established. ECDSA key fingerprint is SHA256:fzEJLqeljHgIwcGY0gUap2sRWLlGPQwUVimhEgkJYBs. Your cursor will not move or indicate you are typing as you enter your password. If you make a mistake, hit enter and you will be prompted again. You should now be connected to your Atmosphere instance. If this is your first time connecting, you may get a security prompt that the server’s host key is not cached in the registry. You may click ‘Yes’ to continue connecting. When prompted, enter your CyVerse username for the request to ‘login as:’ and enter your CyVerse password to connect. Open VNC Viewer. Paste your IP address + “:1” in the ‘VNC Server’ field (e.g. 161.803.39.887:1) and click connect. When prompted, ensure your username entered is your CyVerse username. Enter your CyVerse password and click Ok.
You should now be connected to your instance desktop.